In previous articles in this series on Some Carbs are Better than Others, I’ve covered both Glycemic Index (GI) and Glycemic Load (GL) which are useful measures of how easily carbohydrate-based foods raise the blood sugar of healthy people. For those that are insulin resistant or have Type 2 Diabetes, Insulin Index is much more useful because it indicates how much insulin is required for a specific food. Insulin is the hormone that tells our body to store excess energy as glycogen or fat, and that is also responsible for lowering blood sugar. Unlike GI and GL, the Insulin Index is not limited to carbohydrate-based foods because protein-based foods (have no carbohydrate in them) still cause an insulin response. Some foods that have a low GI or GL result in a lot of insulin being released — and knowing this is important to those who are insulin resistant or have already been diagnosed with Type 2 Diabetes and are working at lowering their fasting insulin levels. As presented in Part 3 of this series Some Carbs are Better than Other (for Diabetics), I demonstrated how 25 g of carbs made from highly processed flour and sugar produced a very different glucose response a Type 2 Diabetic (me!) than 25 g of carbs of an unrefined (intact) food — even though at the time I did this ‘experiment’, I had been eating very low carb for over a year. Why the difference when both had 25 g of carbs? The 25 g of carbs as a cracker with chocolate was a combination of highly refined white flour and fat (chocolate) which raises blood glucose to a much higher degree than a food that contains carbohydrates alone (see The Perils of Food Processing, Part 2) . The 25g of carbs as intact chickpeas that were cooked from soaked, dry ones were fully intact — as they were prepared with the minimum necessary cooking. As covered in Part 1 of the series on The Perils of Food Processing, highly refined and carb-based processed foods cause a much higher and more immediate glucose response due to the incretin hormone GIP, than foods with the same number of carbs that has its plant structure intact (i.e. the chickpeas). This explains WHY I had three times the glucose response with the cracker, as I did with the chickpeas — even though both foods had the same amount (25 g) of carbohydrate in them. What about Insulin Response in response to these two foods? The 25 g of carbs as a cracker with chocolate would have resulted in a huge stimulation of the gut (incretin) hormone GIP in the upper intestine and resulted in a pronounced release of insulin. The 25 g of carbs as cooked chickpeas would not have resulted in a huge stimulation of GIP because they were intact and as a result, the starch in them was not readily available to the enzyme that digests it (α-amylase). In fact, some of the carbohydrate in the chickpeas would have passed through the gut undigested. The insulin response of these two foods (each with 25 g of carbohydrate) would have been very different. What is the Insulin Index? Shortly after I was diagnosed as having Type 2 Diabetes in 2007, I came across a research paper from 1997 called “An insulin index of foods: the insulin demand generated by 1000-kJ portions of common foods”. In this paper, the Insulin Score of a food was determined by feeding individual foods that contained exactly 239 calories (kcals) / 1000 kilojoules each to non-diabetic subjects and then measuring their insulin response over three hours. The results from each food were then compared to the insulin response of pure glucose, which was assigned an arbitrary value of 100%. The Insulin Index ranks each individual food compared to the insulin response of pure glucose. At the time, the graph was quite puzzling to me as eggs, cheese, fish and beef —which have no carbohydrate in them at all, still caused insulin to be released. It would take close to 10 years for me to better understand this. As far as I could see, there were two major limitations to the Insulin Index; the first was that there were only 38 foods evaluated. One really can’t make any inferences based on only 38 foods! The second limitation was that it measured the insulin response in healthy, non-diabetic people. Last year, I had heard that a PhD researcher from the University of Sydney , under the oversight of Prof. Jennie Brand Miller (who had worked on the original study in 1997) had conducted a research project on the clinical application of the Insulin Index to Diabetes (Type 1). In addition to her thesis, she had also created a database of the Insulin Index of a large number of foods. As it turned out, some foods that were high in protein and low in fat (such as lean steak or fish) resulted in a large insulin release and foods such as navy beans or All Bran® cereal resulted in a relatively low insulin response. As it turns out, it’s not only the amount of carbohydrate in a food that influences insulin release, but also protein and fiber. What is especially helpful about the Insulin Index and the database of Insulin Scores is that it enables those with Type 1 or insulin-dependent Type 2 Diabetes to more accurately estimate their injected insulin needs. However, for those with insulin-dependent Type 2 Diabetes, there is another option. Results from recent research studies such as the one-year data from the Virta study have been published and demonstrate that reversal of Type 2 Diabetes symptoms is possible — even for those injecting themselves with insulin! At the beginning of the study, 87% of participants were taking at least one medication for Diabetes but after only 10 weeks of following a well-formulated ketogenic diet, almost 57% had one or more Diabetes medications reduced or eliminated. At the end of a year, sulfonylurea medication was entirely eliminated. Insulin therapy was reduced or eliminated in 94% of of those following the well-formulated ketogenic diet at a year. I don’t provide low carbohydrate / ketogenic dietary services those taking insulin (either Type 1 Diabetes or Type 2 Diabetes), I encourage those that are taking it to consult with their endocrinologist and work with a knowledgeable healthcare professional with CDE certification. As I said previously, people taking any of these medications should not adjust the dosage of their medication without first consulting with their doctor and being instructed by them to do so. The consequences can be very serious, even life-threatening. For example, people taking SGLT2 inhibitors such as Invokana or Jardiance and who decrease insulin dosage suddenly are at increased risk for a life-threatening condition called “Diabetic ketoacidosis (DKA)”. Medication dosages and timing must be adjusted by a doctor. If you are not taking insulin — or have been stable for a period of time after having had insulin withdrawn by your doctor, I’d be happy to work with you to coordinate dietary and lifestyle changes with you and your doctor, as they monitor your health and adjust the levels of prescribed medications. In complex cases, I will ask for written consent to coordinate care with your doctor depending on medications you are prescribed, as your doctor will need to know in advance what level of carbohydrates you have been advised to eat, so that they can monitor your health and make adjustments in your medication dosage. If you have questions as to how I can help you or how I’d work with you and your doctor as they oversee you adopting a low carb lifestyle, please feel free to drop me a note using the Contact Me form on the tab above. Holt S, Brand-Miller J & Petocz P (1997). 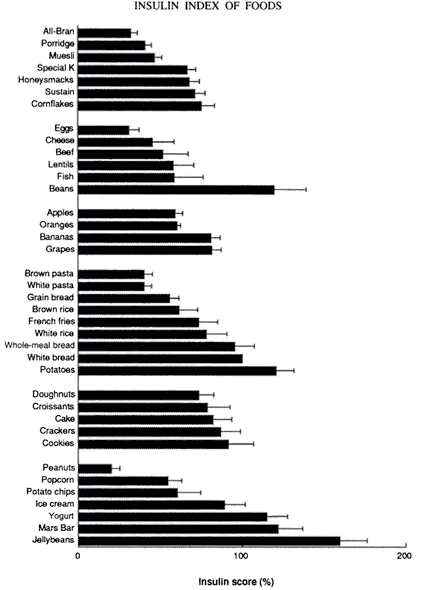 An insulin index of foods: the insulin demand generated by 1000-kJ portions of common foods. Am J Clin Nutr 66, 1264-1276. The American journal of clinical nutrition. 66. 1264-76.